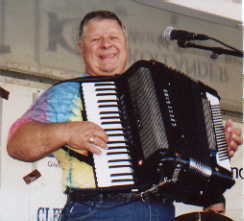 Fritz plays the piano accordion and the button-box accordion in Fritz's Polka Band, which he helped form with his father, Fred in 1978 (when Fritz was just eight years old). In addition to being an accordionist, Fritz is also the lead vocalist. Fritz has been playing the piano accordion since he was six years old. In 1989, Fritz was the proud winner of the National Accordion Contest in Gibbon, Minnesota. Fritz has had opportunities in the past to perform on stage with America's Polka King, the late Frank Yankovic; and Canada's Polka King, Walter Ostanek. Fritz is proud of the fact that he got to perform in the same band as his father for so many years. 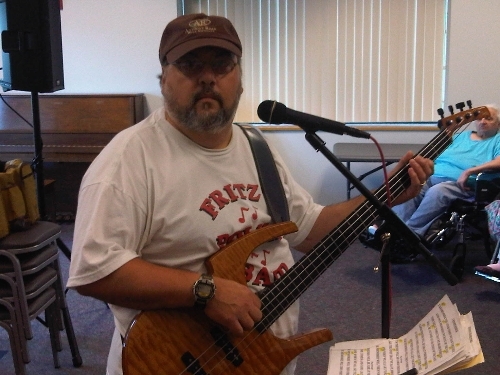 Gabe plays the bass guitar in Fritz's Polka Band. Gabe, one of the original members of Fritz's Polka Band, is also a vocalist. Gabe is a son-in-law to Fred, and a brother-in-law to Fritz. Gabe has been playing guitar for over 30 years. In fact, years before joining Fritz's Polka Band, Gabe played electric guitar in a band called: The Marshmellow Steamshovel. From 1998 to 2003, Gabe (as an electric guitarist) also performed in The Retro Rockers. Gabe has a hobby of collecting guitars. One of Gabe's favorites is a "stand-up" bass. Although Gabe is the bassist in Fritz's Polka Band, he does enjoy playing electric guitar, or even his 12-string guitar. Frank is a guitarist/vocalist in Fritz's Polka Band. One of Frank's favorite songs to sing is "West Leyden Waltz." This is a song that Frank's father, Jim, wrote many years ago. Prior to joining Fritz's Polka Band in 1991, Frank performed in a band that he helped form, called The Nelson Brothers. Mike held his first pair of drumsticks at the age of six . Many years later, and countless hours of practicing, he then mastered his craft by studying all avenues of drumming and live performance, playing in bands from Los Angeles to New York City. Mike has won many solo music awards. He hopes to pave a new road in polka music with his "modern style" drumming and high energy. The late, Fred Scherz Sr.
Fred passed away on November 14, 2009. He will truly be missed. Fred played the piano accordion and sometimes the Swiss accordion for Fritz's Polka Band; which he helped form in 1978. In addition to being one of the accordionists, Fred was also a vocalist. He played the accordion for 60 years! Fred was proud to receive the "50 Years of Musical Excellence in Accordion Playing Award from the Central New York Polka Fans in 1995. Fred had opportunities in the past to perform on stage with America's Polka King, the late Frank Yankovic; as well as Canada's Polka King, Walter Ostanek. On November 27, 2004, Fred was presented with the very prestigious 2004 Trustee's Honor Roll Award from the Cleveland-Style Polka Hall of Fame in Euclid, Ohio, and thus, inducted into the Cleveland-Style Polka Hall of Fame. 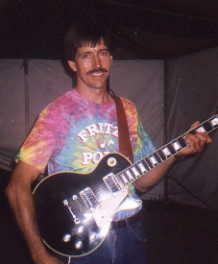 Tom was a guitarist/vocalist in Fritz's Polka Band from 1987 until he retired in 2012. Tom began playing the guitar when he was just seven years old. Tom, a self-taught guitarist, began his musical career by forming The Country Gentlemen in 1958. The Country Gentlemen traveled many miles throughout their 27 years of making music. 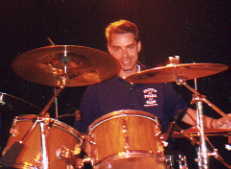 From 1985 to 1987, Tom performed with three different country-style bands. Rick was the drummer for Fritz's Polka Band from 1986 to 2009. Years ago, Rick was a member of his high school band that won many scholastic contests. Al "Rebe" Reber played trumpet and was the lead vocalist in Fritz's Polka Band from 1978 to 1987.